can you not apply for exemption due to your trip’s charitable nature? Is it not ironic that we rely on the Chinese for economic common sense and we rely on the Russians to protect information from censorship by hosting files on servers? In 2 days China has dismantled a mosque, banned islamic head gear and now refuses to pay Carbon Tax. Excellent. 4 weeks before the Year of the Dragon and the Chinese are cleaning house. I have to wonder what would happen if they just don’t pay it and continue to turn up requesting permission to land. Will they be sent out of the airspace of the combined EU countries or maybe they will be shot down like an enemy fighter jet. What a farce! We should all refusr to pay 1 cent in this hoax tax here in australia. That alone will bring this fraudulent government of australia down. Not 1 cent should be the catchcry. Good for them! Everyone should refulse. Three cheers for the Chinese, standing up to this ridiculous tax scam imposed by the EU Eurocrats. No more taxes on flying! Good for China!! All the countries of the world should follow suit! In 2 days China has dismantled a mosque, banned islamic head gear and now refuses to pay Carbon Tax. Excellent. Perhaps our government could take a leaf from our most important trading partners and the source of MOST of our countries income. You better believe if they refuse to pay a carbon tax in the aviation sector they certainly wont pay more for coat that has attracted a carbon tax! Trust the abc to report that…. What’s the matter with other countries.standing up for their country like China has done. This is a total rip-off. Good on China. Pity Australia is too yellow livered not to stand up to the EU as well. The EU has nothing to do with us and the UN as well is totally inept. All members want is money to fill their own pockets and do nothing. Why use taxpayers’ money to feather their ests. Get rid of them all and retain our sovereignty. Thank god someone is finally saying no to the biggest con of the century! The Carbon Tax is just a complete political SCAM and only the foolish, stupid or corrupt support it! Hope China wins! The response from the greens will be interesting. They are always banging on about how china is doing renewables and stuff. Communism and common sense, interesting times! 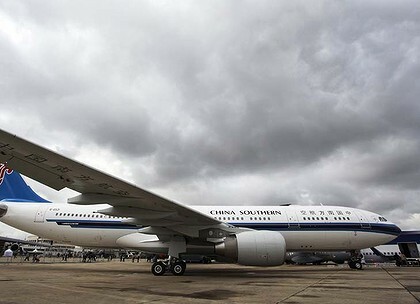 so what do we do now… fly with Air China and say bye bye to Qantas???? Well done by the forward thinking Chinese officials, if the US, Canada, Australia (unlikely here with the green virus pulling the strings) took the same attitude the tourism industry in Eu would be in dire straights and the tourism operators would have to put pressure on the Carbon tax banksters/hoaxsters . Wouldn’t it be interesting if the USA, who already are compleinign about this increase in their costs, followed the Chinese lead and also refused to pay this incredibly stupid Tax ? How soon would it be before the entire EU tourist and many other people rose up against their idioticgovernment – perhaps one week ? The whole Global Warming SCAM is falling to bits and the only good thing about it is that it will bring about the End of Labor Govts. in Australia foreverer. China will have to back off. The Australian government has not yet placed orders for the 2000 plus wind turbines to replace the “dirty” coal fired power generators (e.g. Hazelwood – 1.6 Gigawatt). “You scratch my back I’ll scratch yours” or; Pay the airline carbon tax and we will keep on buying turbines from you. Typical EU tax to the max attitude Now they think they can tax the rest of the world like they do their own poor sods. When can we we expect the next visit from some EU warmist prat congradulating the Labor liars on their brave new carbon tax initiative.Hope China continues to tell them to shove their tax. Approximately 4 million Chinese tourists travel to Europe annually and with Europe in economic doldrums, the last thing they should be doing is alienating these rich Chinese. Now would the ABC report that as being the truth even if it was just EU propaganda? Watch the EU back down when they realise they need China to bail them out of their financial mess. The EU is going to have a nig problem … their subsidies won’t compensate AIrbus, etc. for lost sales; nor soften the financial blow of a disintegrating Euro. That’s the elephant sitting on the toilet. The EU is running out of money to prop up their “project” of which the Euro is a cornerstone for fiscal union and government by the EU-super-state. At least there won’t be any carbon tax on your winnings! Have we not been told by labor and the greens [and that fool turnbull] that the chinese are determined to reduced co2 emissions? did not turnbull publicly state that the chinese were cutting their coal fired power planets [only to replace 1 old with 2 new ones]? China DID NOT agree to carbon emissions at the world talk-fest, in Kyoto [how many attended in jet aircraft and what were their emissions?]. They are a member of the UNFCCC ONLY. The chinese regime of old dictators has a lot to answer for, and their version of communism is rule by capitalist oligarchy, but on this point I agree with them. The EU is screwed because useless countries in the block have always assumed [and demanded] that Germany bail them out [strongest economy in Europe]. Now when the Germans and the French [our arch rivals] want to set them up with a budget and goals, the useless bunch of civil servants in the European Parliament, pass a new tax [like us] under the guise of environmental protection. 36% of voters in the EU elected to approve that Kyoto treaty. That leaves 64%, who do not know or think it is wrong that were ignored. See the parallel to here? The minority tell the majority what to do – all in supposed democracies.